You will see that I have been ploughing through the new Tarot Series with a true zeal to get the Major Arcana completed. You can catch up on the other cards here. We are now up to Card 9 - The HERMIT. This card conjures up a lot of different emotions for me. I say EMOTIONS because there is someone here in this card who is ALONE. Do they look alone to you? do they look dejected? they have a lamp and a cloak over them, are they poor? are they blind? are they COLD ? it looks like snow doesnt it? on some cards we see more of a mountain with the Hermit. Its almost as though we are supposed to imagine that. There is nothing really there except him and what appears to be desolate landscape. Is he lost? has he heard something and lifting his lamp to see what it was? Can you just look at this card and feel things the way that I do? it really raises lots of questions. What is he doing? is it a HE?? how do we know this is not a woman frozen to death with ice all over her face? We dont see a mountain on this Raider Waite picture BUT notice something...the person is lifting a lamp and looking DOWN. Something else, they are looking to the West. This card is Number 9. What is a 9 in terms of a cycle? 9 is THE END OF A CYCLE. Nines ARE ends. We get to this point and then we begin again in the 10. Though 10s are the end of the journeys in the pip cards (we then turn to people images) the 9 in the Major Arcana does give end cycle. Actually it represents the same in many respects in the Pip Cards. It always is difficult to try to explain all this as when cards are laid in a reading they sit next to other cards and will give you a clear idea about what this END or ENDING is. We have the 10 next and the journey rolls on or begins again . Lets not get complicated and stick to the path of the Hermit. If I saw this card come up I would think AH...something here is not being seen. Why? because when its dark the light of a lamp will only light up a CERTAIN AMOUNT OF SPACE AROUND YOU. It will not project endlessly but it will give you an IDEA of what might be directly ahead. The fact that someone is alone here holding up this lamp might depict that they want to find something out. Maybe an issue they want to see clearly. Maybe they want to have something revealed but do not get the full picture? As always there are many text explainations but Im going with my own thoughts on this card to represent stages in your life. This card the Hermit is a VIRGIN card. The snow on this card is white and a symbol of some kind of purity. Snow is crisp and very bright when it begins to lay and it is not sullied or dirtied initial. It is a clear snow white blanket to begin with. Even if you run out in the snow if it is a heavy snowfall it will cover up your tracks in no time retaining its purity and eliminating your footprints. 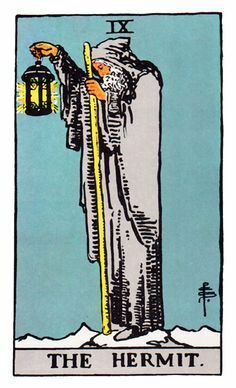 The Hermit card represents the FINGER OF GOD. The purity of the ground is here. Imagine being alone for a long time shut away from civilisation, noise, cars, pollution, traffic. Your mind would almost have been emptied of toxic thought just as someone who has been on a cleansing diet to get rid of toxins to purify their insides. We do ingest all kinds of poison in life you know and that can even be the T.V ! Many things damage our mind. This person is on their own, POSSIBLY having a period of introspection. They are away from THE NOISE OF LIFE , they are OFF the beaten track. Are they ok? are they an ok person? what about the person that lurks in quiet places? yes that can show up in a Hermit card too. Lurking in quiet places holding the lamp to see who is about. Cards are not always what they appear. They can represent all kinds of scenarios. It looks innocent enough doesnt it? The Hermit standing here on his own. He has a stick though. That stick could be a stick to help him trudge along. Maybe he hurt his leg. Maybe there really is snow and it helps him trudge through it. But remember a stick is a weapon as well. That might not even be a stick right? like I said, all sorts of things to bear in mind with this card and only other cards can pick out exactly the situation . However, if you are truly intuitive this card will tell you exactly what it means in a reading just by itself depending on the issue and question. Does this person appear to be looking back over their life? maybe because the light wont illuminate everything perhaps they forgot some of the things that happened in the past. Maybe they are looking FORWARD instead of back hoping to SEE what is ahead. Maybe it is an intuitive card. Perhaps the person has some psychic elements. Hummm...you do not need a lamp for psychic elements right? or maybe you do. Psychics can only see SOME things, not EVERYTHING and the snow represents white noise? being as its all around in this card. Perhaps it fuzzes up the issues, hides tracks, hides the lay of the land HIDES THE TRUTH? Yes maybe there are some psychic elements here but in this card you cannot see the entire truth. It takes a good lamp and brighter then this one? because this card can represent hidden issues. When I see this card in a missing person case I know that the person may be hidden out of sight. Or that there may be some aspects that are hidden. What that means is some things really are known. It is not all in the dark, we have SOME information BUT we know we dont have it all. Whats under that snow? is it gravel, grass, pasture, rock? we dont know. We cannot even FEEL what is beneath our feet if the snow is thick because snow has a texture that can harden and make you feel its a harder surface even if its grass. There is a LOT UNKNOWN IN THIS CARD. As strange as it may seem we can often get a ROOF OR A COVERING with the Hermit. Ie Actual or 'covering up'. Snow covers up. Think of the elements on this card. You cannot see what is covered up We already questioned if this is a man or a woman. Yes it could be a man with a grey beard. I would personally plump for that and in fact I often do. If it was a woman she is hiding the fact. Or that fact is hidden. I cant see beneath that cloak can you? Are they dressed up like that because its freezing or do they not want to be identified properly, hence the hood. Theres a lot you can talk about even about a card that seems to be as empty as this. This card however, is FAR from empty believe me! Did you notice the person does not have gloves on. Maybe its not that cold. Its not always cold in Switzerland for the skiers, theres plenty of sunshine there , or maybe the Holiday ads have got it wrong! A lot of interesting questions then. When we get past the Strength card we come to the Hermit. Sometimes in our lives we might want TIME OUT. Maybe we have been strong too long ? Maybe we are tired of BEING strong, Want a break from that? We might want to discover things,other things a different prospective in life. How many people walk around with smart phone and never look up or never look around them? Maybe we want to go on a voyage of discovery, a pilgrimage even if we dont leave our house we can do that. Got an old record collection? do you realise how many memories you can recall just listening to a song from a certain period. Its like bulb starts flashing and you remember old situations, friends, what you did when....etc. Sometimes we LIKE TO BE ALONE. We like to have thoughts. We like to just put all current thoughts out of our head and adopt a virgin brain. By that I mean, looking at things afresh. When did you last have a really huge ice cream with a flake in it and dozens sauces and speckles of chocolate on there? you might have remembered when you did years ago and perhaps want to experience that again AFRESH. If you have not done something FOR years it will seem all brand new as an experience once more. Maybe life is SOOOOO busy that its just great to stick the headphones on and shut it all out. Just retreating and examining the world from afar...like peeping into it. Not getting involved but keeping informed at a distance perhaps. The lamp shows that you might have lost something, or you might want to see something a bit more clearly. It might be there to premeditate a situation, have a quick look, nope dont bother....next ! There are many things as I have said that we could portray in this Hermit card. Some might say it is not to do with hiding. It is. You are hiding yourself. This hermit is standing on the edge of something he does not look as if he is going to fall or has any intention of falling. He just wants to take a closer look if he can and get himself in a position to do that but he is clearly standing still. He is still in many ways. His eyes are doing the work with the lamp. He is looking, searching, illuminating. There will come a time when that family you made, that job that takes all your time, the clock which is the very fabric of your existence is all TOO MUCH. You want to get away and just go discovering. You want to either relive something or look at projects you put down ages ago and never picked up again. You might want to do something you used to do. In life everybody needs that time out. In this card you could be at the end of that. IE, you took that time out and its time to return so your just checking how the land lies...or perhaps you are thinking ENOUGH Im off to do a bit of ME TIME. This card is so interesting and I could talk a long time about it. It is a very poignant card to me. In times when you are alone, it is a space that only you and the divine fill. You are never alone remember, there is always that divine pure energy that is with you, your shadow in life, your comforter. There are some odd and unpleasant situations that could arise with this card depending on what you are focusing on in a reading. 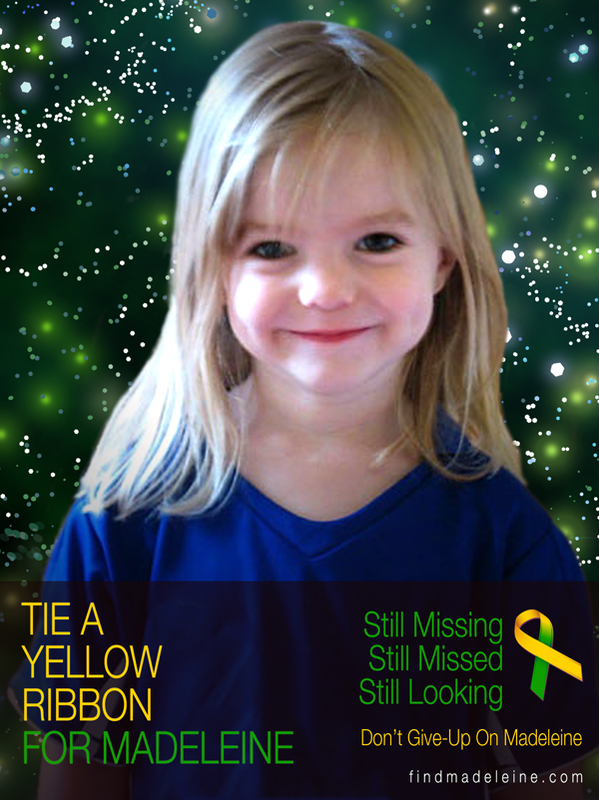 As I have said before with Missing person cases I know exactly what I am being shown here as a rule. This card reversed can suggest being hidden. Though some people may not realise it or accept it, this card can show preying on the young. We wont go there or into that . There are many subtle elements that after a long study will and can bring together a much expansive view of this card. I am not dwelling on the darker elements here. I am looking wholly at how this card would figure in your life. You might prefer not to be around people when this card shows up. You might like your own company and you could be checking that nobody followed you to the attic while you pull out all your old school books!! A very interesting card. If you feel alone and you dont need people but you still need someone (IF THAT MAKES SENSE TO YOU ) there is the Lord/the Divine or whoever/whatever you consider to be your religious connection. No words have to be said. Nothing needs to be spoken. All that is needed is to shine that light , have pure thought, tread purely. Your thoughts will be read and that is where we understand what is meant by the Finger of God. The connection is the light. You might not SEE much but there is an attempt to be enlightened. The Hermit does not speak. The Hermit likes to be alone. Maybe he will prod you with that stick if you bother him !! This card could represent a period of your life when you want to take things in and consider them quietly. You may be wishing to study, you need to THINK . You may wish to not be disturbed at all because you are trying to discover something new or learn something and do not want to have any outside interruptions. Got a family? good luck with that! One thing I want to leave you with is VIRGO. That is the sign of the Hermit. Virgos are very particular, quite fussy at times, might even have an OCD touch because they so like ORDER. If you get to a point in your life and are set in your ways you will not appreciate it all getting undone by another. If you ask someone to do something for you , its likely you will be checking to see they did it properly. Virgos are neat minded people. There will be something pretty neatly done here. Just like that snow. Its perfect isnt it. not a footprint in it. You will or could be at a stage of your life that you really cant change your ways. I know I should not laugh. Never move around Virgos belongings because if they put them in a special place DONT touch them THEY WILL KNOW YOU HAVE! Because they are very precise. They like things cut and dried. They dont want all the fancy bits to go with it. You will get to that point where you feel this way. Maybe not all the time but we all manage to pick up habits. We are creatures of habit. This card will show you how much of one you really are. Its likely you will be more picky and more fussy about things because you are used to how something has been done. You will and can find fault if something is not adding up or levelling out. Thank you for reading through the HERMIT. There is always much more to consider and scenarios to cover but this is a short brief . Join me next for the WHEEL OF FORTUNE.